Buck fifty a day. According to the automaker, that is all it will cost you to operate your new Chevy Volt Extended Range Electric Vehicle when used in EV mode only. The car that GM is calling the “game-changer” is arriving in select markets this month. We spent some quality time with the Volt and its team members on a recent jaunt in the Texas Hill Country north and west of Austin. The event provided a few eye openers, some educational opportunities and at least one typical situation faced by drivers in semi-rural areas. Much has been written about Volt over the past few years. I remember talking to engineers at the big auto show in Detroit in 2008 and since have published my share of articles and opinions as well. Volt is unique and, above all perhaps, Volt is first in this segment. Volt is not a new hybrid. Hybrids rely on the electric and/or gasoline motors to drive the powertrain and propel the vehicle all the time. 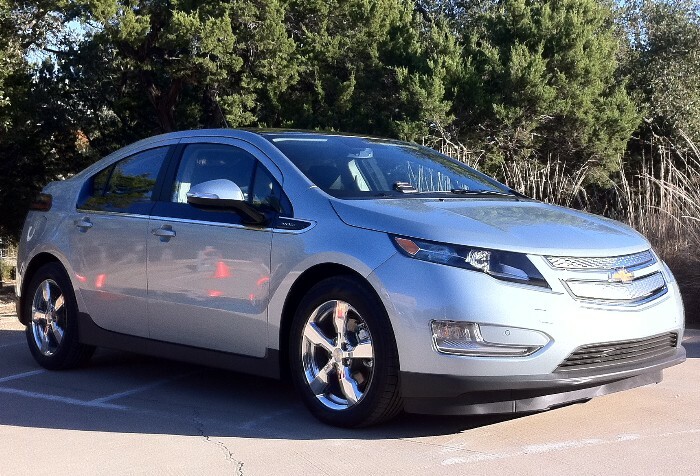 Volt is always being driven by the electric motor, similar to a locomotive. Yes, those big, belching, horn-blowing train engines are actually propelled by a diesel-electric motor where the fossil-fuel burning diesel engine provides the energy to turn the electric motor which in turn spins the steel wheels on the rails. Volt employs a large T-shaped lithium-ion battery pack to store energy to power the electric motor for the first 25-50 miles of driving. Why such a wide range? 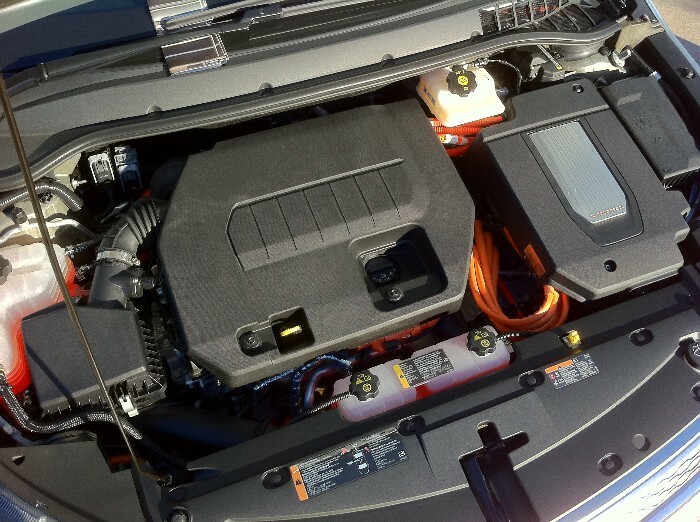 As we found out one chilly Texas morning, the battery pack aboard the Volt, like any other battery pack in the world, varies in efficiency due to outside conditions such as temperature and is affected by use of onboard accessories such as front and rear defroster, heater, etc. 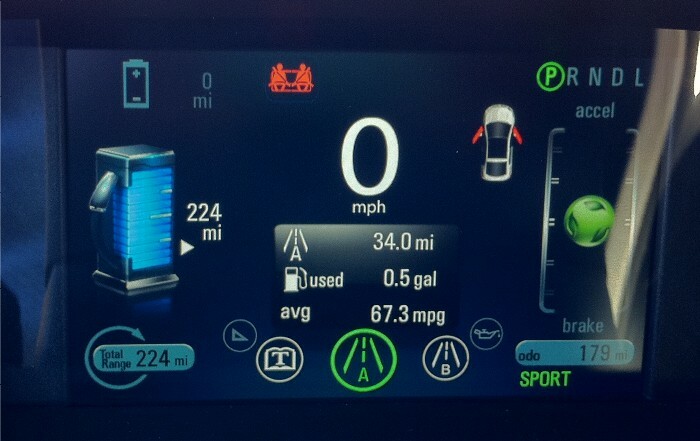 The EPA has averaged out its rating of the Chevy Volt to an electric range of 35 miles with an additional 344 miles after the onboard gasoline engine kicks on to supplement electricity to the drive motor. In our “real-world” findings this week we saw slightly lower figures. My driving habits gave me a combined gas/electric range of only 258 miles and my co-drivers did not fare much better. Perhaps Volt buyers will achieve better results and I have to believe that they will as the early adopters will be those who have already chosen more environmentally-friendly lifestyles. For those living and working in an urban arena with daily combined driving distances of less than, say, 40 miles and never seeing the speedo top about 50, these are the consumers that can live on a buck fifty a day (after making your car and insurance payments that is). Now, for those who do adopt this sort of lifestyle and driving scenario, what about those 9.3 gallons of gasoline in the tank? Is it going to go bad due to age? Will the gas engine seize up due to poor lubrication from sitting too long without firing? Volt engineers have taken this into consideration and provide some intelligent software solutions to these. If the vehicle sits too long the Volt will automatically start itself to cycle the engine lubricants and use some of that stale fuel. The fuel system itself is pressurized so kinda like that fine bottle of wine you want to preserve Chevy seals the fuel system so the gasoline will stay fresher longer. 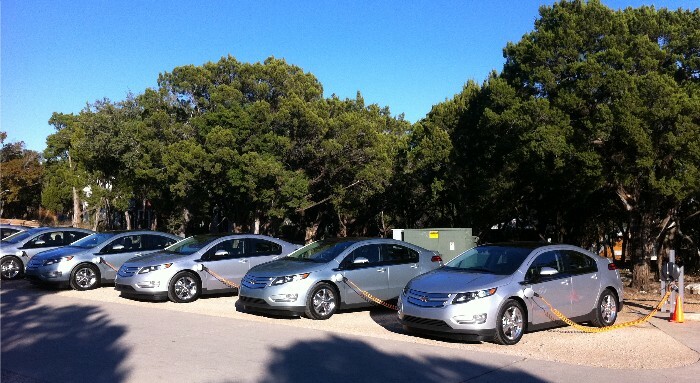 When we pulled into the parking lot of the resort hosting our drive event we saw a row of Volts cabled to charging posts similar to what one sees at an RV park. 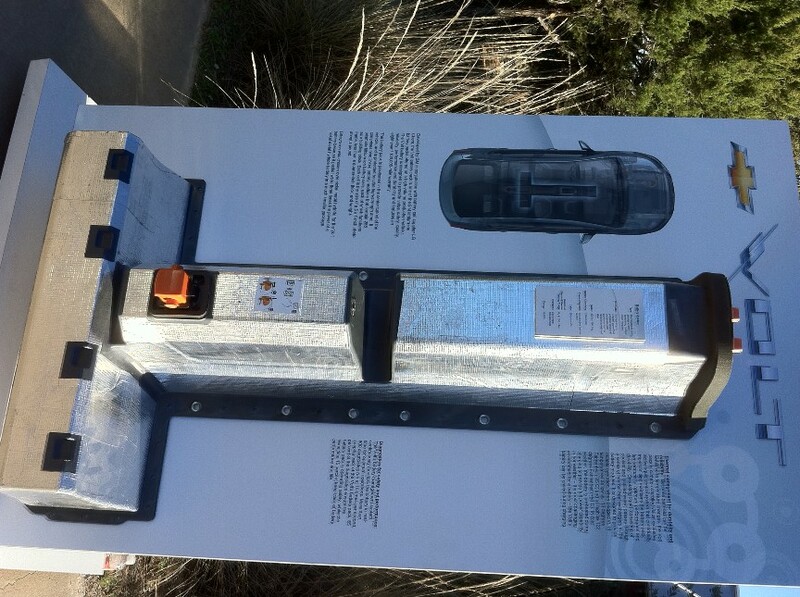 Chevrolet brought the 240-volt charging units to Austin and tethered them to a transformer box on the property. At home, the Volt owner simply needs to employ an electrician to connect the unit to a spare 220V/20A circuit on one’s breaker panel. About four hours is all that is required for a full charge and if the higher voltage is not available all Volts include a 110-volt extension cord in the rear cargo area that can be plugged into most conventional outlets, with charging times about doubled. And once at the end of that mystical 379-mile driving range given the Volt by the EPA, drivers merely seek a traditional refueling station for another 9.3 gallons of premium fuel and they are once again on their merry way. Volt styling is similar to the new Cruze by the same automaker with a few new touches outside and some very high-tech inclusions inside. Information is fed the driver via two video displays, one indash and the other atop the center stack, and most functions are done via touch controls. All the usual safety systems are employed on Volt as the vehicle still has to pass muster with NHTSA and four adults can ride fairly comfortably although vehicle range is greatly reduced due to the added heft (go get thinner friends). 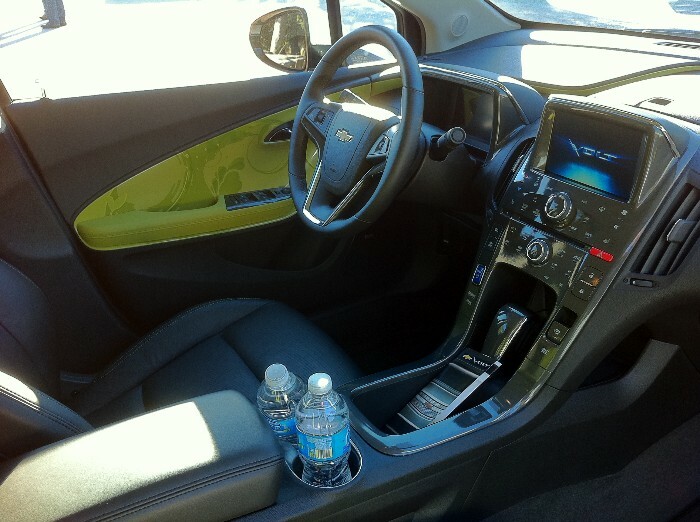 Volt is quiet, smooth and stable and offers a comfortable ride. When the gas generator engine kicks on you do notice it. While not as loud as those heard in an RV campground this small 1.4-liter four-cylinder engine is both felt and heard. The Volt operates in one of three driver-selectable modes: Normal, Sport and Mountain. We learned that one should switch to the latter mode some distance before actually reaching steep grades. The Volt propulsion system was described as achieving maximum power by utilizing stored energy as opposed to using power on demand as in current hybrid vehicle technology. Changing to Mountain mode automatically turns on the gasoline engine to build energy reserves in the battery but at a cost of maximum propulsion. You will feel power being taken from the drive system when changing modes. One can still drive at highway speeds it is just the equivalent of losing your passing power. drivers. Yes, I just said this car is smarter than you – and me. No talk of solar charging panels in the roof of the vehicle just yet but it seems only natural as the Volt roof is already a separate panel from the rest of the body components. Yeah, that will be coming next, mark my words. Pricing will be around 41 grand but creative adjustments by your CPA coupled with some rebate action by the federal government will bring that down a bit. Initial availability is limited to six markets (including Austin, Texas where we were) with full rollout coming by the end of next year when battery production is increased. Volt is new, Volt is now and Volt is only a buck fifty a day. Next Next post: 2011 Ford Explorer: Is this the SUV of the 21st Century?